A game for all you football soccer lovers out there, the ultra-famous PS3/Xbox game has hit WP, PES 2012 brings a almost complete console experience to your Lumia device; including exhibition games, UEFA championship, Training and alot more. Trial mode only supports a ‘Quick Game’ which is always Real Madrid Vs. Barcelona- so that should give you a nice feel of the game physics before buying. You can control your team wither with the accelometer built into the phone or using a virtual joystick (accelometer was a bit confusing at first but it’s actually pretty cool), anyways check it out guys. 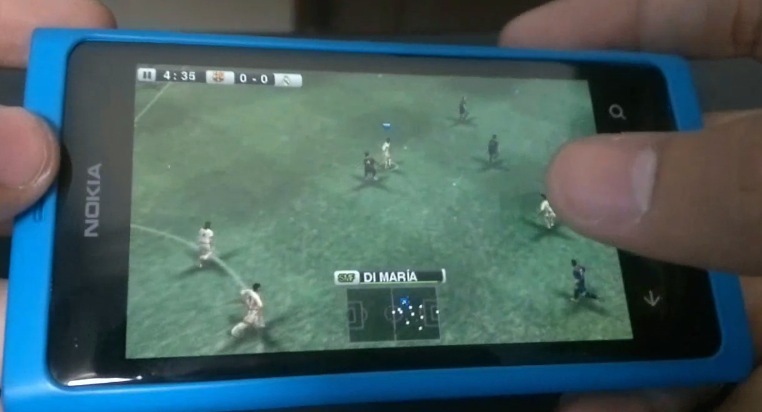 The unrivalled and award-winning football simulation is entering a new season on Windows Phone 7! – Unrivalled realism: Experience incredible gameplay and focus on tactics, goals and winning trophies while competing against the most advanced team and player AI on the market. Striking animations such as referee cut-scenes or goal celebrations and technical moves (diving header, bicycle kick, and more) will make you feel the beauty of the game. – Exclusive UEFA Club Competitions: PES 2012 includes many of the best European club teams in the officially licensed UEFA Champions League™ and UEFA Europa League™ modes. – Online connectivity: Prove your skills and unlock the various Xbox LIVE achievements, compare yourself to your friends, make it to the top of the leaderboards and become the world’s greatest PES player. – Outstanding Accessibility for Beginners and Experts: The uniquely designed true flow™ control system provides instant access for players of all levels by utilising the accelerometer and AI-supported touch controls. More advanced players are presented with unlimited freedom of play by being able to master classic console-style controls with virtual pad and buttons.